It was a chance remark during conversation over a morning coffee that Ramachandran mentioned about Revathi being a sportswoman. That his wife was a gifted basketball player is not known to many in the field of Bharatanatyam. Revathi and Shuddha Nrittam have become synonymous. However, today basketball’s loss is Bharatanatyam’s gain. Her father R Venkataraman who encouraged her in sports had lovingly kept a scrap book and browsing through it, seeing old photographs, a bag full of trophies and cups, I marveled at her self-effacing humility. 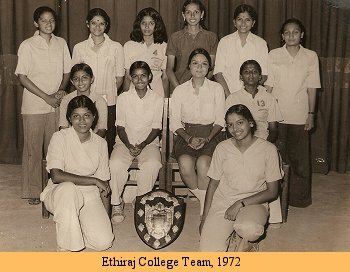 The sports page of Indian Express dated 19 March 1979 carries a group photo with Revathi in it of the Madras Division team that won the Madras University Inter-divisional basketball championship for women for the fourth successive time. 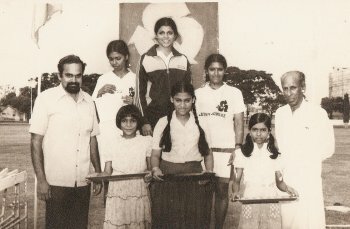 She was one of those who were elected to represent Tamilnadu in the National Basketball championships held in December 1979. 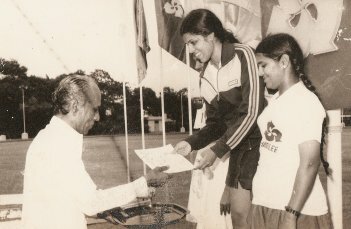 One clipping reads: “Among women it was Revathi of Madras region who caught the eye, getting first place in the 200 metres sprint and second in the long jump.” The Basketball Federation of India had been asked by the Indian Olympic Association to keep the team ready to fill a vacancy for the Moscow Olympic Games. The 12 member team included Revathi Venkataraman. N Kasi (Madras) and Revathi Venkataraman (Madras) claimed the men’s and women’s individual championship in the two-day All India Indian Bank platinum jubilee sports meet. Revathi was working in Indian Bank and represented the Bank’s team. Accomplished and multi-talented Revathi also excelled in painting. But with so many choices, when it came to learning dance, she opted for it. She gave up a career in banking, playing veena, basketball, sprint et al and when her mother Jaya Venkataraman took her to Mangudi Dorairaj Iyer, the dye was cast. 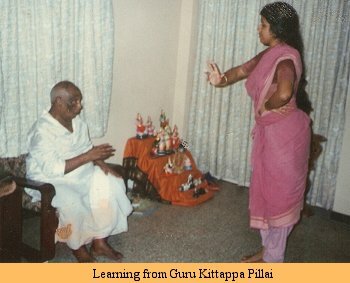 Among other items in a Bharatanatyam repertoire, he trained her in Shuddha Nrittam, which made her recitals scintillating and of the few disciples of her guru, Revathi’s name came to be associated with Shuddha Nrittam. When I was researching on Melattur Bhagavata Mela Natak and genealogies of various gurus, somehow those guiding me had not mentioned Mangudi Dorairaj Iyer’s name or about Shuddha Nrittam, so I could not include him in the Guru Parampara chapter. Later on learning more about Shuddha Nrittam, I planned two years back to write about it. Sruti monthly had carried years ago, an article on it and when Mangudi Dorairaj Iyer passed away, featured his photo with Revathi. By the time Revathi performed in Mumbai for Kal-Ke-Kalakar and Sur Singar Samsad in 1983, I had left Mumbai and joined Rabindra Bharati University, Kolkata, as Uday Shankar Professor and Head of the Dance Department and missed Revathi’s performances. During my visits to Mumbai, I used to meet my senior colleague and dance critic S V Vasudev (SVV), who wrote for The Times of India as a dance critic in my place. He drew my attention to Revathi’s talent. Of her June 1983 performance, wrote SVV: ‘She does not have that stunning figure to make her look as if stepping out of a fashion page; neither does she flaunt any acquired sophistication. Yet, she has a lot more than other young dancers have - a good, firm grounding in the Bharatanatyam technique and a dedicated, disciplined approach that brings to her dance the beauty of art in abundant measure. Revathi Venkataraman can readily be rated as the best dancer at the 21st Kal-Ke-Kalakar session, certainly in the Bharatanatyam group. A student of the late Guru Mangudi R Dorairaj Iyer, currently being guided by two elder disciples of the same master, Revathi’s movements carry distinct impress and true ring of the tradition, unalloyed by any concession or compromise for stage effect. No wonder, Revathi has in successive years earned encomiums from several quarters and carved a niche for herself among the leading lights of dancers including the reigning ‘prima donnas.’ Today after quarter of a century, she has kept up the high standards endearing herself to her contemporaries with her focussed dedication. Reams have been written about her by legendary critics including Subbudu, scholar Arudra, and a sharp observer, scholar, critic and admirer VAK Ranga Rao and others. During International Dance Alliance and The Music Academy’s special program in honour of Rukmini Devi’s memory along with the leading dancers, Revathi’s Bharatanatyam performance featured Shuddha Nrittam which won instant applause from a packed auditorium. Wrote VAK Ranga Rao in Sruti: ‘Is the dancers’ reaction to the new, the innovative, the odd or the unusual efforts of other dancers receptive and open? I am saying that it should be, not accusing that it is not. The maximum applause in terms of loudness and duration - this was not from any particular faction or partisan group as slyly suggested by some - was reserved for the numbers Revathi Ramachandran and Swarnamukhi and the part of Nala-Damayanti featuring the heroine (Krishnaveni) and the group of swans (led splendidly by Master ‘Soumya Bheema’ Satyajit). 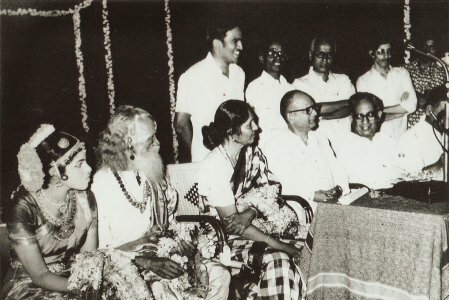 In 1987 at Bangalore at Nupura’s Nitya Nritya conference where our dear redoubtable late T S Parthasarathy, musicologist and secretary of the Music Academy of Madras was present, Revathi gave a lec-dem on Shuddha Nrittam. Demonstrating the tandava oriented dance, she displayed verve, clean lines, and anga shuddha. In Alarippu she produced cross rhythmic patterns. It was followed by Shuddha Nrittam which she danced with full confidence and competence. I recall that as a concluding item she had chosen Shringaralahari for abhinaya. Since I was to present my paper on Odissi with Aloka Kanungo, we did not have enough time to catch up with each other. A year later she had written reports on Natya Kala Conference at the behest of T S Parthasarathy for The Hindu, which showed her keen sense of observation. Revathi came with Vempati Chinna Satyam’s troupe to Kolkata for a Kuchipudi dance festival, organized by G M Sharma in 1991. She had taken part as Lord Shiva in Hara Parvati dance-drama. I used to often meet her at Vempati garu’s Academy during the rehearsals in Chennai. And in my book on Kuchipudi published by Abhinav Publications, she is represented as Kuchipudi exponent. But I did not know much about her Shuddha Nrittam and other achievements. Another connoisseur and scholar B M Sundaram has written about her in glowing terms. Going through some of these reviews I realize that she is a low profile artiste carrying on her work with cheer and joy. If the approbation has come from the knowledgeable connoisseurs and critics, that is more than enough for her, as she knows that what her guru taught her is something precious and not controversial. It is now after nearly two decades during the last two Madras seasons that I have been able to sit down at leisure and learn more about her guru and details of Shuddha Nrittam. After her arangetram in 1973, when her guru Mangudi Dorairaj Iyer conducted the program, Revathi never looked back. Her mother Jaya Venkataraman’s full support and guidance helped Revathi in establishing herself as a serious dancer. Number of performances followed in various parts of South India and also in North India, as her talent was recognized with critical acclaim. 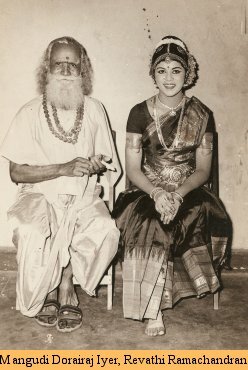 After marriage, her husband Ramachandran encouraged her to take up dance as a full time activity. Revathi brought up her son Hari, and daughter Mansvini, managing her professional career and household activities. She established her Kalasadhanalaya institution in 1987 to train young dancers not only in Shuddha Nrittam but also in traditional Margam and all round theoretical course, herself taking lower grade and higher grade courses conducted by Government of Tamilnadu, and also under Dr. Padma Subrahmanyam. The holistic approach helped her immensely for her thematic dance-dramas and group productions. Training in nattuvangam under Seetarama Sharma of Kalakshetra fame, she equipped herself with sound knowledge and started imparting training at her institution, getting it registered as a trust in 1994. 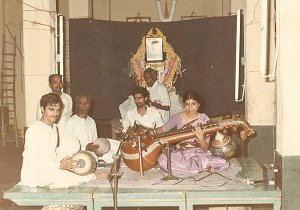 She studied veena under Kalpagam Swaminathan and it helped her considerably in the musical aspect for her group work. A series of thematic dance-dramas followed – ‘Ambalathil Aadum Jyothi’ in 1994, ‘Jaya Jaya Bharath’ in 1997, ‘Lakshmi Vaibhavam’ in 2001, ‘Om Saravana Bhava’ in 2003 and the recent work ‘Dayinee’ in 2008. During these years, she had toured USA, Europe and other countries. 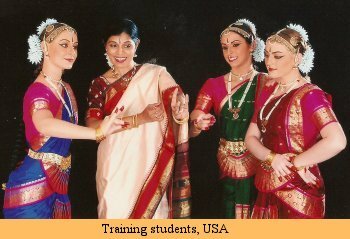 Besides training her daughter Manasvini, who had her arangetram in 2004 (‘a chip off the old block’ as the saying goes, has shown promise with talent she has inherited from her mother), Revathi has a number of students from Chennai and abroad, who regularly visit Chennai for intensive course. Her hands are full with choreographing, teaching, conducting classes and performing. Invariably awards came in terms of recognition from institutions like Sur Singar Samsad’s ‘Singar Mani’ in 1983,The Music Academy’s award as ‘best dancer in Spirit of Youth Series’ in 1987, Bharat Kalachar’s ‘Yuva Kala Bharati’ in 1990, Narada Gana Sabha’s ‘Best Dancer’ in 1997 and Indian Fine Arts Society’s award in 2007. From 2001, she has been conducting ‘Bhaavaarpanam’ festival, as homage to Guru Mangudi Dorairaj Iyer, during his death anniversary in August, presenting leading dancers from various dance forms. She is a Council Member of International Dance Alliance (IDA) and has organized dance festivals with Leela Shekar presenting leading dancers. About Shuddha Nrittam she feels that she was blessed by her guru to receive traditional knowledge. And before he passed away in 1980, he gave her his mridangam and cymbals, which she treasures as rare heirlooms. For the last two years, interacting with her, I find her a simple person, intensely involved with her art and happy with whatever recognition that she has received. A follower of Swami Parmarthananda, a disciple of Swami Dayananda Saraswati, Revathi studies Vedanta and feels enriched. All this has helped her bring depth to her dance presentations. She is not averse to presenting shringara, but prefers to depict it in a restrained manner. She has gained tremendous stamina from her basketball and sports days as she says it has given her strength and an ability to concentrate on whatever she undertakes. She has no regrets that she gave up sports. Dance to her has been an all consuming passion and it has helped her grow as a human being besides scaling artistic heights. Author’s note: I wish to acknowledge the critical information on Shuddha Nrittam I have gained from Revathi and writings of Dr.Arudra. My own researches in Bhagavata Mela Nataka and Kuchipudi dance-drama traditions have further helped me gauge the importance and relevance of Shuddha Nrittam. All the photographs are courtesy Revathi Ramachandran.